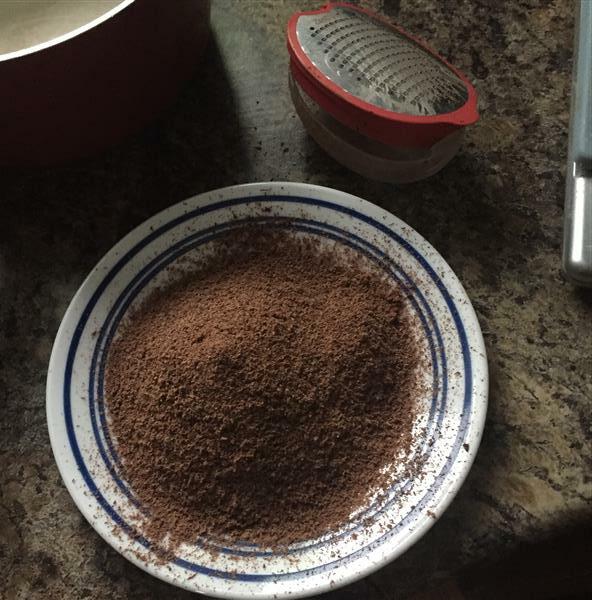 I may have used too fine of a grater for my chocolate, because what I ended up with was basically double chocolate cookies. Which is fine, but not what I was expecting. I used 70% dark chocolate, which made for a fairly strong chocolate-y cookie. The other somewhat unique twist in this cookie recipe is the use of browned butter. Browned butter is basically butter that has been boiled on the stove until all of the water evaporates out, and the milk solids in the butter have darkened. I’ve done this process so many times that I neglected to take any pictures of it. I also toasted walnuts and broke them up, rubbing the skins off as much as possible, to get rid of the bitterness that comes with walnut skins. With the (cooled) browned butter, and the walnuts ready to go, the rest of this is basically a standard chocolate chip cookie. 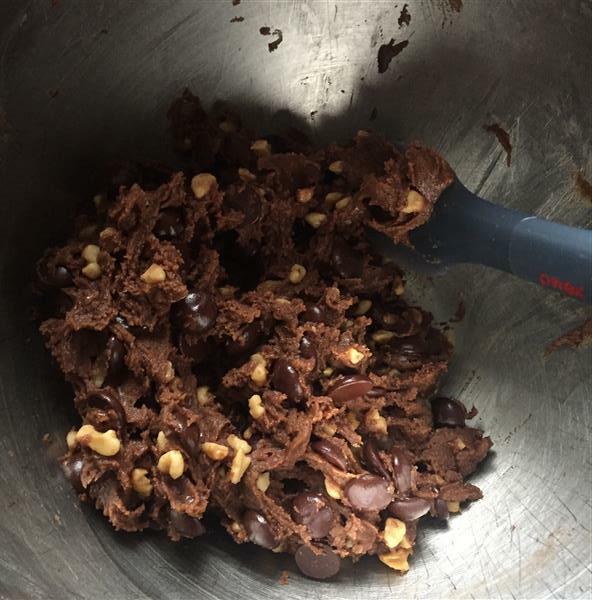 Mix your butter with the sugar, add an egg and vanilla, mix in the flour (and salt and baking soda), then add the chocolate chips and nuts. Let the dough rest in the fridge for anywhere from 1/2 an hour to 24 hrs, then scoop out onto baking sheets and bake. The recipe calls for pressing them down, but I was worried that pressing them would make them run out too thin, because of the added chocolate in the dough. That seems to have been the right call, because they baked up just the way I like them. For reference, here are the regular batch (without grated chocolate) from when I made them back in December 2014. Looks like I got one extra one out of the batch this time. Must have been that added 1.5 oz or so of chocolate! Like I said above, I enjoyed these, but I have to admit, they’re not my absolute favourite chocolate chip cookie. You haven’t had a perfect chocolate chip cookie until you’ve had one made with freshly ground flour. I thought I had a pretty good handle on the chocolate chip cookie back in 2013, but those ones were really only fantastic when they were within a day or two of being baked, which just isn’t good enough. I also tried the one that Evil Cake Lady linked to in the comments on that post, and it was my go-to for a while, but I still kept thinking. I remembered the use of browned butter in this recipe from the Baking Bible, and I thought there had to be a way to combine the depth of flavour that comes with browned butter with the sweet/nuttiness of the freshly ground whole wheat flour. Now, my “perfect” label is reserved for my own variation on this recipe. I’ll blog about that one, sometime. I just hit on it over the Christmas holidays. 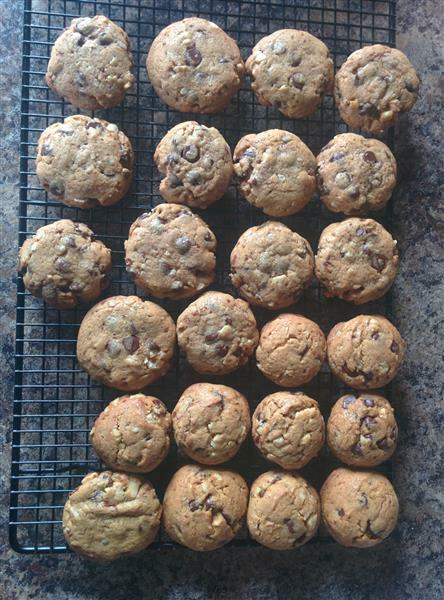 Posted on January 11, 2016 by KristinaPosted in The Baking BibleTagged chocolate chip cookies. 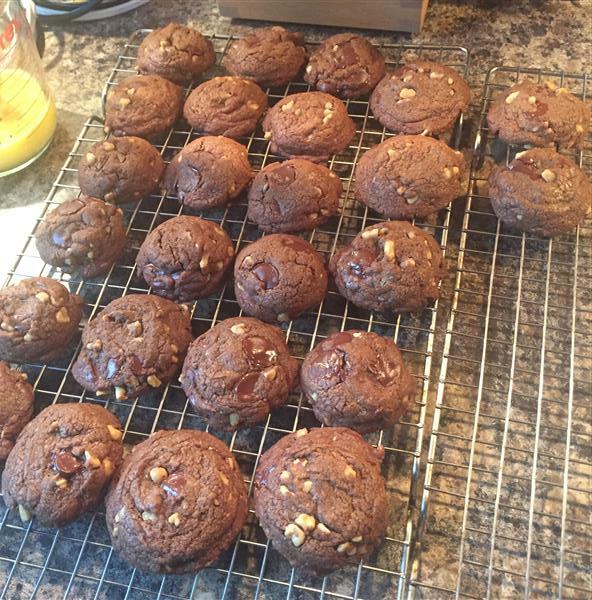 they came out so beautiful,like you i added ground dark chocolate …so good! Can’t wait until you blog about your cookie discovery! I’m so envious of the freshly ground flour. Love cookies in a tin. Wonderful to know that you have been working your way through chocolate chip cookie recipes. I need to tear a page out of your book. You know, I’ve never had anything made with freshly ground flour. You make me think. Orangette’s version of Boyce’s whole wheat cookies is still my favorite, but I’ve never used freshly ground flour. I’m looking forward to reading about your new favorite! The ‘double choc’ version is a very nice looking cookie. I like your quest to find the perfect recipe. I’m sure your colleagues do as well.